Quite an understated birthday celebration (so far) compared to years gone by (see previous Google birthday logo examples here.) 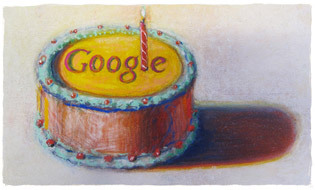 The Google home page today shows a simple birthday cake image by Wayne Thiebaud. However, Google birthdays are normally the launch pad for some sort of announcement / development, I wonder what today holds in store..........?